This is the second in a series of posts that take a closer look at some of the pink ribbon branded products in stores right now (last week’s post featured some unusual products). Nice to see another yogurt company entering the mix, also some good use of Facebook and MySpace in campaigns. Please let me know if you have more information on these products or if you see any unusual pink products out there. Beneficiary: National Breast Cancer Foundation, Inc.
Back story: Consumers enter codes on the Dannon web site to activate a $.10 per code donation to the NBCF. They also have a Facebook campaign, Pass the Cup, where every “Like” will also result in a $.10 donation, up to $5,000.After reading the press release, I think this is the first year of the partnership. 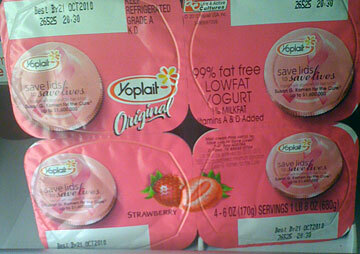 My $.02: Certainly is easier for consumers to participate than Yoplait’s “wash and mail” lids campaign. Facebook is a nice touch, too (although the $5K cap isn’t mentioned anywhere obvious on their page). 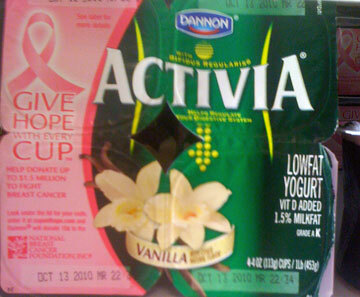 Back story: The Komen/Yoplait partnership has been cultivated (hah!) over the past 12 years and has resulted in more than $20 million in donations. This year, Yoplait is dedicating $250,000 of the money raised to fund innovative ideas that Komen local affiliates have for raising breast health awareness and prevention in their Hispanic communities (through their Fondo Yoplait Para La Mujer Hispana).It should be noted that Yoplait is a General Mills company, and this $1.6 million donation is separate from the $2.25 million Pink Together donation. My $.02: I like the $250K earmark for breast cancer awareness in Latinas, and that Yoplait will be working with the local affiliates to determine what programs are put in place. Dates: No. 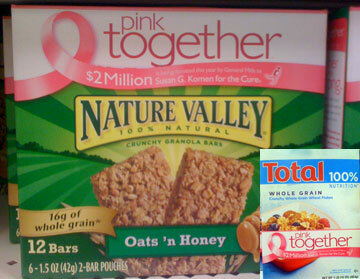 General Mills will donate $1 to Komen for each inspirational story submitted, comment posted or virtual flower bouquet sent on PinkTogether.com (up to $20,000) and each shared message of hope posted on the Pink Together Facebook fan page (up to $5,000) during October. 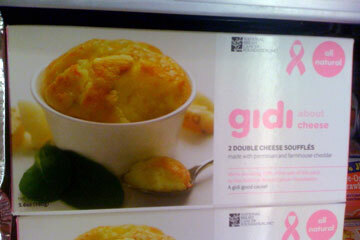 Back story: This is the fourth year of the Komen/General Mills partnership. Pink Together has connected more than 690,900 survivors and supporters through its online community. My $.02: I like the use of MySpace for this campaign. 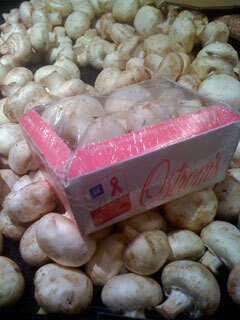 Back story: This donation is to help fund research scientists at City of Hope are conducting on the cancer-fighting potential of mushrooms. Clinical trials at City of Hope are now under way in testing the potential of white button mushrooms in reducing estrogen production in women. Did I buy? Sadly, I’m not a fan of fungi. Back story: There’s no information on the Entrée Foods website or the NBCF web site. Entrée Foods is not listed as a partner on the NBCF partner page. My $.02: They have a side panel dedicated to the program. Not sure if it’s 10% of sales, or 10% of net proceeds. Back story: I’ve looked everywhere (Kraft, Velveeta, NBCF, Google) and can’t find partnership specifics for Kraft or Velveeta. 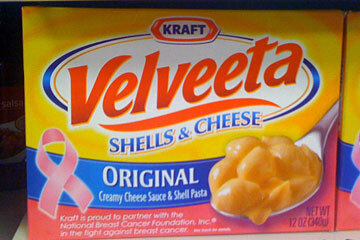 Neither Velveeta nor Kraft are listed on the NBCF partner page. My $.02: I’m surprised there’s no information readily available on this.